Milk and Honey, a lovely little grocery on Baltimore Ave. in West Philly, sells local produce and foods and specialty food items, alongside olives (I’m obsessed with the Sicilian Green), international cheeses and deli meats. The also offer ice cream, pastries, prepared food, and a full breakfast and lunch menu. On a recent sunny Saturday afternoon, I found Clark Park overfull with a flea market, LARPers, a rock band, a drum circle, the dog bowl, and the children’s playground, so I took my novel to Milk and Honey and grabbed an outdoor seat. And a delicious panini. 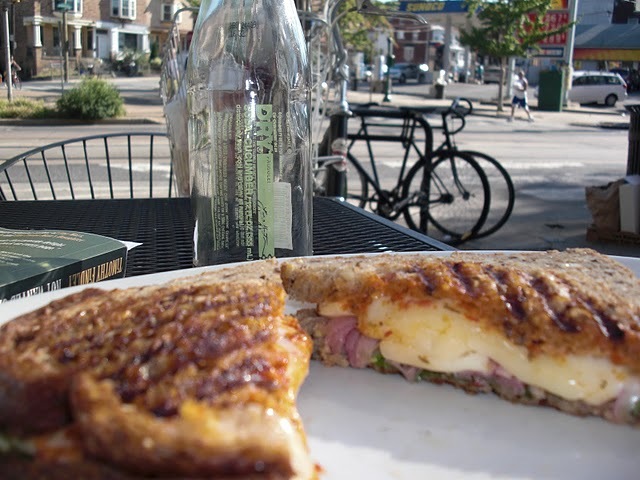 Milk and Honey offers numerous vegetarian paninis, but the one pictured above is called the Spruce Hill – buttery multigrain bread, gouda, pickled onions, greens, and pesto. It was perfectly crisped and the cheese oozed out onto the plate. I paired it with a refreshing, low-sugar cucumber soda, and a handfull of those Sicilian olives I couldn’t wait to take home, and had a wonderful late-afternoon lunch.